Last year, when I was moping around my mother-in-law’s house feeling sorry for myself because getting a degree is hard, she gave me some excellent advice. I didn’t see it for the gem it was at the time, because, well I was far too busy sighing and gazing wistfully out the window at the mist creeping up the Ostend Valley. It was all terribly romantic, which of course was the payoff to such behavior. Everyone secretly enjoys a good pity party, no matter how miserable they are. And I was fairly miserable. “What you need is to be busy, sitting around doing nothing but worry will send you ‘round the bend.” Sandy said. But what was I to do? It was study break, leading up to final exams, and in theory the only things I had time for, were studying, eating, studying, going to the bathroom, and on the odd occasion, sleeping. I didn’t have the time to be any busier than I already was, even though my days basically consisted of staying indoors frantically flicking through one hefty biology tome before turning to another in a frenzy of crazed studiousness. There was no variety. Every day was the same, each blurring into the next with no definition, no colour, and no joy. After the exams, things got even worse. The endless job hunting, and the endless rejections, led into a haze of lolling on the couch staring dispiritedly at the utter crap on TV. Sandy was 100% right. Something had to be done, before I went completely mental. So I got a hobby. I took up my long neglected knitting needles, and began attending a knitters support group. We meet on Monday mornings to discuss the hopelessness of our mutual addictions to all things yarn related. It’s not like AA. No one there could ever be accused of helping a fellow addict to get better. Instead we end up with various scary acronyms like SABLE which stands for Stash Acquisition Beyond Life Expectancy. If someone described as SABLE did nothing but knit for the rest of his or her life, they would die before exhausting the stash. But people at this stage are already too far gone, and go completely weak at the knees with the merest hint of wool fumes. And so the stash grows. Industry begets industry. By becoming involved in one hobby, I soon found myself involved in many others. 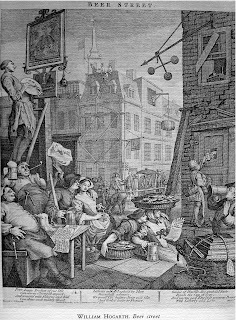 A year whizzed by in a blur of activity, and then (as you all know) I got hooked on brewing, and the endless myriad of things pertaining thereto. 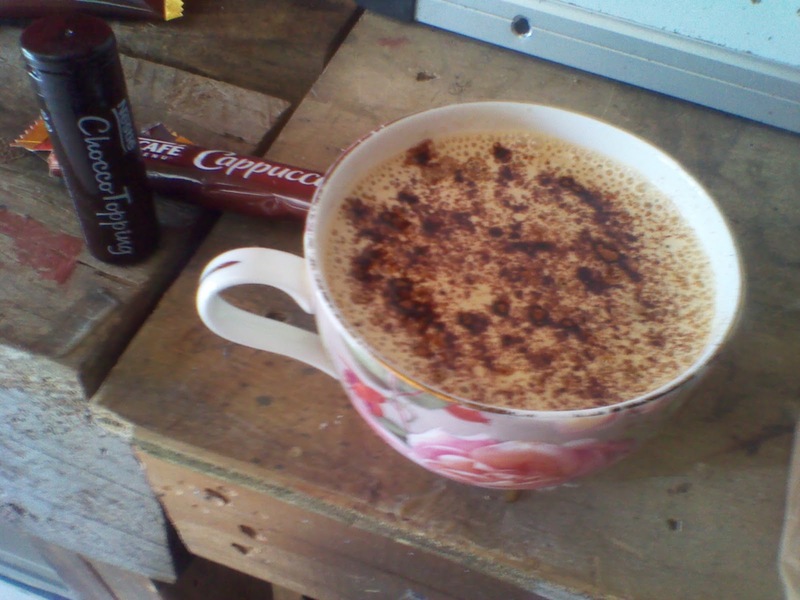 Being industrious is greatly aided by humanity's favourite stimulant: caffine. This is an example of the delicious things that can be done while still in the process of making beer. This is brewster’s coffee (in this case, a cappuccino). The sweet wort is used in place of hot water and removes the necessity of sugar. Having things to do is a wonderful cure for the blues. So is listening to the blues. It makes you realise that hey, life isn’t so bad. I don’t have to deal with those steadily depressing low-down mind-messing working in the car wash blues (or the blues that come from slogging away at any other completely crap job for which I am over-qualified and underpaid). Learning to brew beer is an endlessly rewarding thing to do, by which I mean it does tend to yield vast quantities of that amber elixir. Last night it all began to make sense. 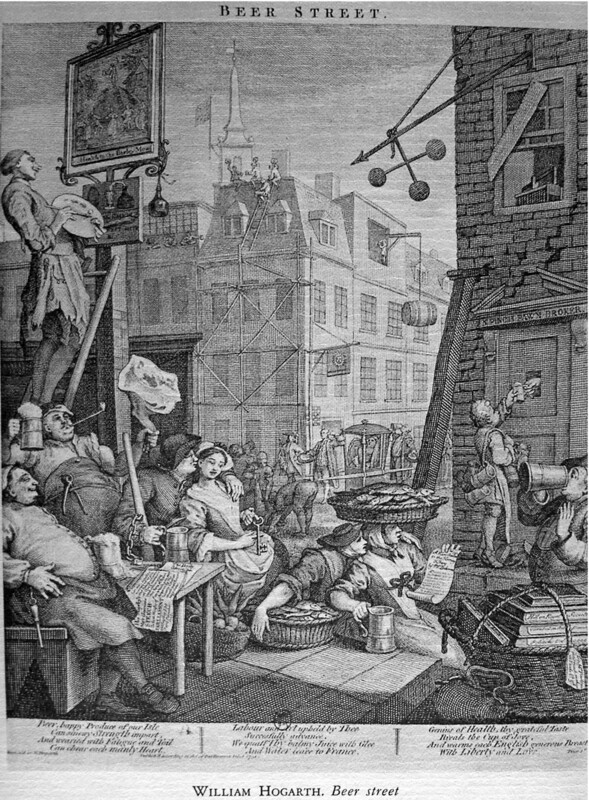 I was enjoying a quiet Kölsh (or two) – very proudly since I had helped to brew it, and it was tasting delicious – when Alan mentioned a diptych by William Hogarth so I looked it up. 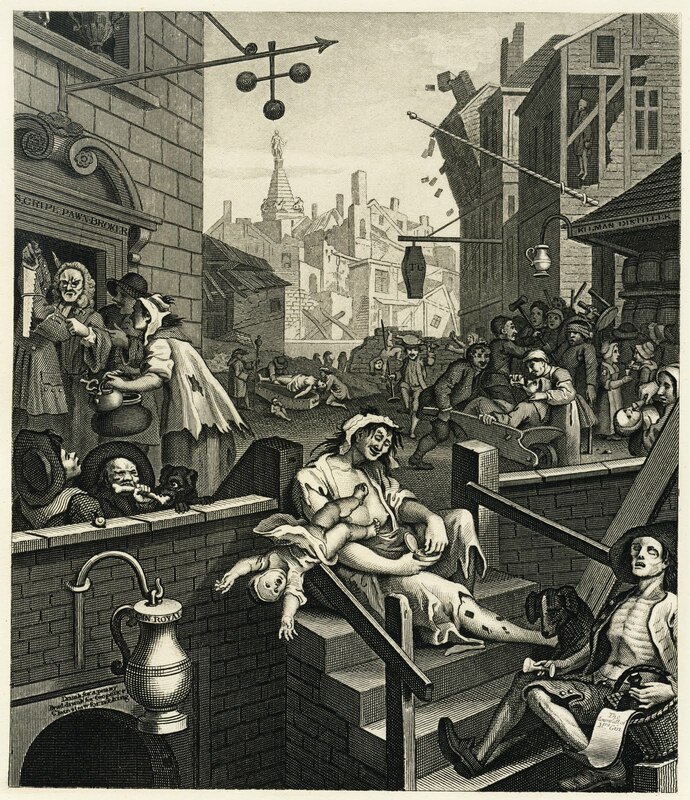 This first picture, entitled Gin Lane is the artists’ comment on a society where gin also known as “mother’s ruin” was the drink legislated into favour. The debauchery and carelessness depicted is in stark contrast to his imagining of Beer Street. In which all and sundry are gainfully employed and happily married. I found these pictures absolutely fascinating. The more I looked the more I saw, and the more I wanted to look. So I came to a decision. I am going to take a walk on Beer Street (metaphorically at least) and just see where it goes. I’m already quite keen to take this brewing lark a little more seriously, and see whether I can turn my newfound hobby into an actual job. I’m pretty sure all the happiest people start off that way. 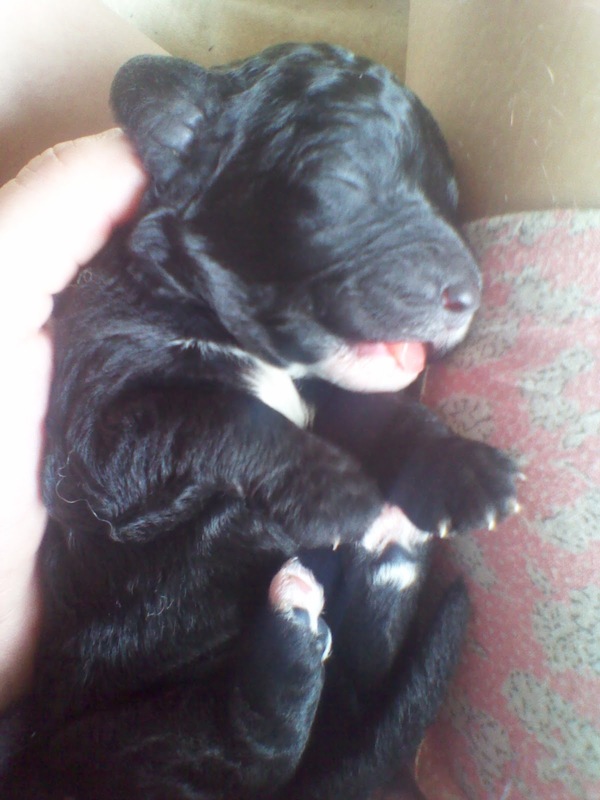 Oh and here’s a puppy. Like the writing...keep it up.